Sorry... the 2017 Toyota 86 is no longer being sold as new. 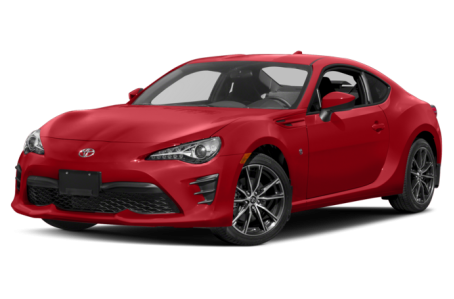 Instead, take the first step to a great deal on 2019 Toyota 86 with a free price quote! The 2017 Toyota 86 is an all-new, 2-door, rear-wheel drive sports coupe. The “86” name is a derivative of its original inspiration – the AE86 generation of the Toyota Corolla Levin/Sprinter Trueno, also known in Japan as “Hachiroku.” It replaces the discontinued Scion FR-S and shares its platform and engine with the Subaru BRZ. Overall, the 86 has a more “aftermarket,” aggressive appearance than its FR-S predecessor. The front-end features an even bigger bottom mouth opening with tri-strake motifs on each side. Amber turn-signals, air vent garnishes, and an 86 emblem can be found on the front fenders as well. Standard features include LED headlights, LED daytime running lights, a dual-pipe exhaust system, and 17-inch alloy wheels. Under the hood, the 86 is powered by a standard 205-hp, 2.0-liter 4-cylinder engine mated to 6-speed manual transmission and RWD. A 6-speed automatic is also available, decreasing horsepower by 5. Fuel economy for the 86 Manual is an EPA-estimated 21/28 mpg city/highway. It raises to a 24/32 mpg rating for the 86 Automatic. Inside, the 86 has a sporty, synthetic suede interior with front bucket seats and a 60/40-split folding rear seat. The center stack features the 86 Display Audio system that includes a 7-inch touchscreen, Bluetooth connectivity for phone and audio, voice command recognition, and a USB port. Air conditioning, cruise control, power windows/locks, and a leather-wrapped steering wheel come standard. Standard safety features include an advanced airbag system, antilock brakes, an electronic stability system, and a backup camera. 11 of 12 (91%) consumers said they would recommend this vehicle to a friend.